Henry Cavill (TV’s Immortals) puts on the red cape in Man of Steel, filmmaker Zack Snyder’s (Sucker Punch) take on the Superman story. Russell Crowe plays Jor-El, who sends his baby,Kal-El, off to Earth as his planet crumbles around him and criminals led by General Zod (Michael Shannon, Take Shelter) are banned in the universe. As Kal-El grows up on Earth as Clark Kent, he discovers he has superpowers and grows into the Superman we all know and love, kindling the curiousity of reporter Lois Lane (Amy Adams, Trouble With the Curve). 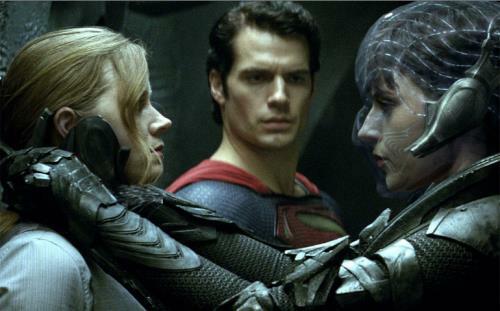 When Zod tracks down Kal-El, he comes back and tries to terraform Earth fit for his kind. Superman, of course, has to stop him. Man of Steel also stars Kevin Costner (Hatfields & McCoys) and Diane Lane (Secretariat) as Clark Kent’s adoptive parents, Laurence Fishburne (Contagion) and Richard Schiff (TV’s The West Wing). digital copy and instant streaming of the movie through UltraViolet. “Planet Krypton” – An exploration of Krypton and its lost society. 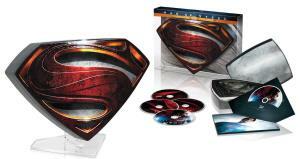 The Blu-ray 3D Limited edition also comes with a metal S glyph with a lucite glass stand. And Amazon has its own Limited Edition containing figurines of Superman and General Zod, priced at $53.98.